It was a magical winter wonderland on December 9th at the Childress Vineyards in Lexington, North Carolina. 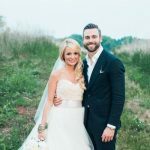 Nascar Driver Austin Dillon and his beautiful bride Whitney Ward were married in front of their closest family and friends in a romantic ceremony. The pavilion was draped with beautiful blush linens and elaborate chandeliers provided romantic lighting. Snow covered the ground and big flakes were falling for the first half of the day and made the day whimsical. Austin and Whitney shared their first dance in a gorgeous tented reception. Following their first dance Austin and Whitney’s dads each gave a very moving toast to the couple. They cut their gorgeous 5 tier cake and moved on to the dance floor. 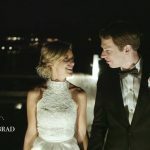 Along with their guests and bridal party, Austin and Whitney Dillon danced all night and celebrated until their incredible sparkler exit. All the trees were decorated for Christmas at the Childress Vineyard. The glowing tree lights and the sparklers provided a stunning exit as Mr. and Mrs. Dillon drove off into the night in a vintage car. 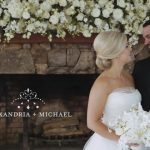 Here is a wedding trailer from their magical day!